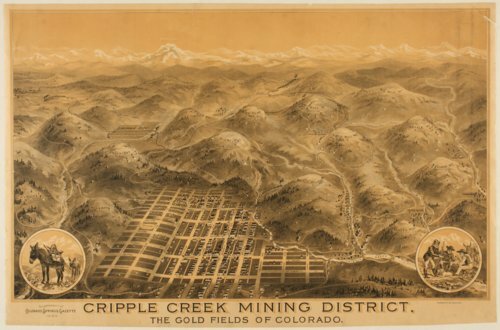 This lithograph shows a bird's eye view of Cripple Creek, Colorado at the time gold mining was happening. It was a supplement to the Colorado Springs Gazette. It shows buildings on various named streets in Cripple Creek. Street names are given and Cripple Creek flows through the town. It gives the names of various mountains and hills surrounding the town. Pike's Peak is in the center back. The left inset shows two burros and the right inset shows several miners. In the distance is Cripple City and Midland. The Midland Terminal Railroad is running through the whole area. The item was produced by the Denver Litho Co., Denver, Colorado.